Which one of us didn't eat fast food before? all of us did that indeed, you might feel hungry while in rush and fast food would be your first option. No wonder we call fast food in our public culture (junk food), it has many properties of junk as it usually contains unhealthy ingredients in several ways. 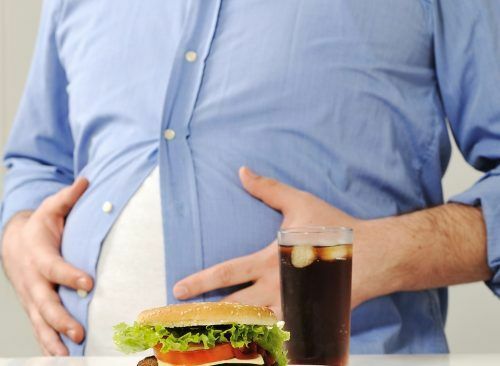 Consuming junk food on regular basis reflects on our health in many ways, in this article we are going to talk about 5 bad side effects of junk food on our health. An old man James Dean once said "live fast die young, leave a beautiful corpse", people were much thinner and fast food was a new trend. Today people in most of the developed world get more than half of their calories from processed, fast, and fake food. The fast food health risks are shocking, And it’s only getting worse with regular consumption. Check out the image below for some of side effects of fast food. What are the side effects of fast food? Do you know the side effects of sugar and salt ? most of the fast food products are made of these two ingredients without much balance regarding normal healthy consumption levels. White poisons as we call it are highly refined and can influence your energy levels causing a large influx of carbohydrate into the bloodstream, these high levels of sugar (calorie) influx causes blood glucose levels to get too high and in response the body stimulates insulin to try and remove the excess amount. When this happens quickly you can feel very energetic for one minute but a slump in energy levels can occur soon after. This slump often promotes your body to try reaching for a quick fix in the form of another junk food to fell better again a vicious cycle!. High levels of salt in junk food can also affect people with tendency towards having a high blood pressure. Hypertensive patients and also patients with renal problem can get severe surges in blood pressure levels in reaction towards salt levels in junk food. By long term eating fast food there are some impacts on your mental performance. Depending on many researchers in Tennessee, it was found that children who ate fast food more than three times per week scored less on literacy and numeracy tests. It is now known that what an individual consumes can play a role on their mental performance as our brain need a steady supply of glucose to function well. The surges in energy that can occur when you eat fast food can also disrupt energy supply to the brain making it feel fatigued and lethargic. This process occurs due to lack of proper control over energy supplies as they tend to apply in surges rather than steady levels of energy supplies, this is due to the high caloric nature of fast food. These days, dementia is one of the most recent discoveries associated with the consumption of junk food. You may know that insulin is produced in the pancreas and it helps in the transportation of glucose to fuel the body as it promotes transformation of glucose into fats and the process is reversed by glucagon which is an opposing hormone to counteract insulin effects. However, the fact you may not know is that Insulin is also produced in the brain where it helps in carrying signals between nerve cells and forming memories. A study conducted at the Brown University shows that too much fatty food and sweets can substantially increase the insulin levels in our body. Just like in the case of Type 2 Diabetes, with higher levels of insulin, the brain stops responding to this hormone and develops what we call (insulin resistance). This can restrict our ability to think, recall or create memories, thus increasing the risk of dementia. Researcher Suzanne de la Monte M.D. a professor of pathology, neurology, and neurosurgery at Rhode Island Hospital and the Alpert Medical School of Brown University was the first to uncover this association and reveal the bond between high insulin levels and dementia. Following this discovery, most scientists refer to Alzheimer’s as a form of diabetes of the brain. I bet you know this one. People who consume fast food four or more times a week, get increased risk of dying from heart disease by 80 percent. Fast food cause a much higher risk of getting a heart disease because of high level of saturated or trans fatty acids caused by junk food consumption. These fats (fatty acids) contribute to high cholesterol levels which can predispose atherosclerosis and obstruction of coronary arteries which supply the heart with blood. If every one take his fast food on his own so how the family will meet together?!. It seems ironic but somehow true that fast food culture could cause our family meetings to get less frequent as food ceremonies are considered one of the most important causes to bring the family together. Everyone can buy and eat walking in the way, driving a vehicle and during his work at office. Actually it's your decision, we can't take an action on our own as fast food business is run by big corporations which will try everything to convince you how good and tasty their food is. However, you need to stay in good shape and health and also keep your family bonded. Try to focus more on family culture and healthy lifestyles and quit consuming fast food if you can.